Trimingham is a small parish on the North Norfolk coast, containing the village of Trimingham and a small area of woodland to the west. The name ‘Trimingham’ may refer to the Old English words for enclosure of Trymma’s people. There have been a number of objects from the earliest periods of human occupation recorded in this parish, including a number of flint axeheads from the Palaeolithic and Neolithic periods (NHER 6784, NHER 13369, NHER 22941), as well as a Neolithic scraper (NHER 14030) and a Neolithic (NHER 6785). The cropmark of a possible Bronze Age ring ditch (NHER 38954) has also been noted, just 85m east of Beacon Farm. A possible Iron Age or Roman field system (NHER 38896) has been recorded stretching across a large part of the parish, just south of the village. Despite this, no objects from the Iron Age or Roman periods have been recovered, although this may be related to that fact that’s unlike many other parishes, very little metal detector activity has taken place here. In light of this, it is perhaps unsurprising that there are no objects from the Saxon period either, and the only objects dated to the medieval period are a small number of pottery sherds recovered from the beach (NHER 41580). 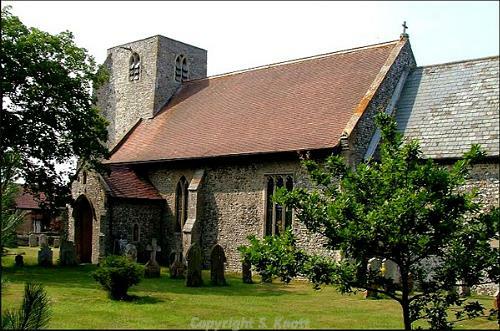 Although Trimingham does not feature in the Domesday Book, it does have a medieval parish church. The church of St John the Baptist (NHER 6805) has a surprisingly short tower, perhaps unfinished, or perhaps the result of the extensive restoration under Thomas Jekyll in 1855. One late Perpendicular style window survives in the nave, as does a Decorated style porch with niche to the south. Unlike the nave, the chancel has clearly Perpendicular windows. 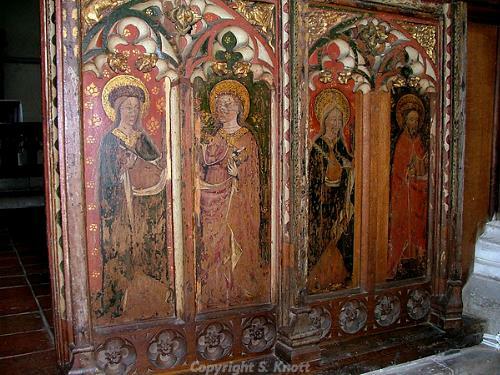 Inside a screen dating to 1500 has a number of richly painted saints, and there is a 14th century octagonal shafted font. Unfortunately there is only one other medieval site, the site of a flint house which was excavated in 1930 (NHER 13276). There are also limited remains from the post medieval period. Of interest is Manor Barn (NHER 17199), a 16th century flint and brick structure probably first used as a house. Two others are listed by English Heritage as of architectural interest; these are 17th century Hall Farmhouse (NHER 47324) on Church Street and its contemporary Bizewell (NHER 25397) on Trimingham Road. Also of a similar date are the cropmarks of possible field boundaries (NHER 38932). From more recent history, RAF Trimingham (NHER 6799) is an established site in the east of the parish, which has been in use since its existence as a beacon in the medieval period. During World War Two it became an RAF site in 1941, and was a Chain Home Low (M-Series) station, later becoming a Chain Home Extra Low station, as well as an ‘Oboe’ station. In the 1950s the site was remodelled as part of the ROTOR programme, gaining a large underground bunker, and although it was closed in the 1960s, it was again in use during the 1980s. Also of interest are the remains of a post war bomb disposal railway (NHER 41581), which was used to carry explosive devices to area of the beaches where controlled explosions could take place. Ruth Fillery-Travis (NLA), 23 January 2007. Morris, J. (General Editor), 1984. Domesday Book, 33 Norfolk, Part I and Part II (Chichester, Phillimore & Co).